After many years of producing the ornate and whimsical Kri Kri tableware, I started a new line which I call “VIT”, meaning “white”, in Swedish or “rapid” in French. It’s inception came from a desire to do something fresh and simple. It also gave me an opportunity to push in a new direction and to work in porcelain. 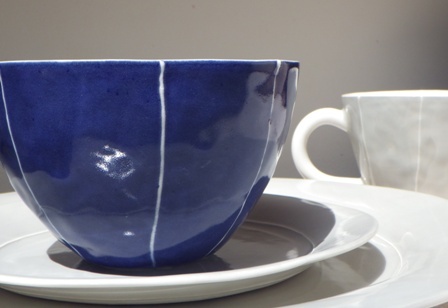 Since committing to this project in 2012, I hired a small manufacturer in Portland Oregon to make the tableware. When they couldn’t fulfill orders, that endeavor was ended Additionally, I took VIT to the International Gift Fair in NYC twice to promote it and was thoroughly stimulated! What a challenge to design a booth, create promotional materials and ship it all across the country! It has all been a crazy and stimulating learning experience! Now, I am undertaking production of VIT myself, in-house at Kri Kri Studio in Seattle. This has meant buying new equipment to use exclusively for porcelain and finding someone with a RAM press to press plates for me in Seattle. Using the RAM press speads up roduction and reduces the amont of warpage the plates are prone to. (By the way, all my molds are made from originals that I formed by hand to the best of my ability, so they still have a very individual quality that one doesn’t get with machine tooling.) The first batch of salad plates is in the works now and I have started pouring bowls and making mugs. Stay tuned for the results of my next firings and progress!